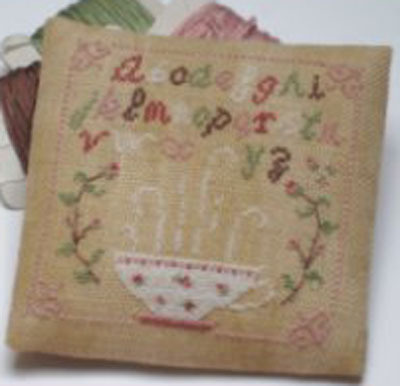 "Tea Magnet" is a cross-stitch chart with instructions translated in English. This pattern was originally designed to cover a magnet if stitched as a miniature. A "chocolate" version is also available (see below the "related products" section). Special stitches: This is a pure cross-stitch design with a few straight stitches. This pattern shows 5 colours (DMC stranded cotton numbers on the chart). The model on the picture has been stitched on a 32 count linen colour "marbled brown" (Zweigart vintage) as a miniature using one stand of cotton over one thread of fabric. But you can work it in full size using two strands of cotton over two threads of fabric / one block of Aida. Recommended Fabric: of your choice regarding the type (linen / evenweave / Aida) and the stitch count, colour "light brown" or "marbled brown", 35x35 cm (14x14 in).